You have to follow his steps while using PC. Step 1: after every 20 minutes of staring your PC , break your concentration turn your head a little and look around the objects at which are at least 20 feet away. What's the purpose of this?>>Little physics involve in this answer. This will change the focal length of your eyes , this exercise is must for the tired eyes. Step 2: blink your eyes for about 20 minutes to moisten them. I know this is awkward but nothing is precious as your health. Step 3: this one will take a little bit of your time. 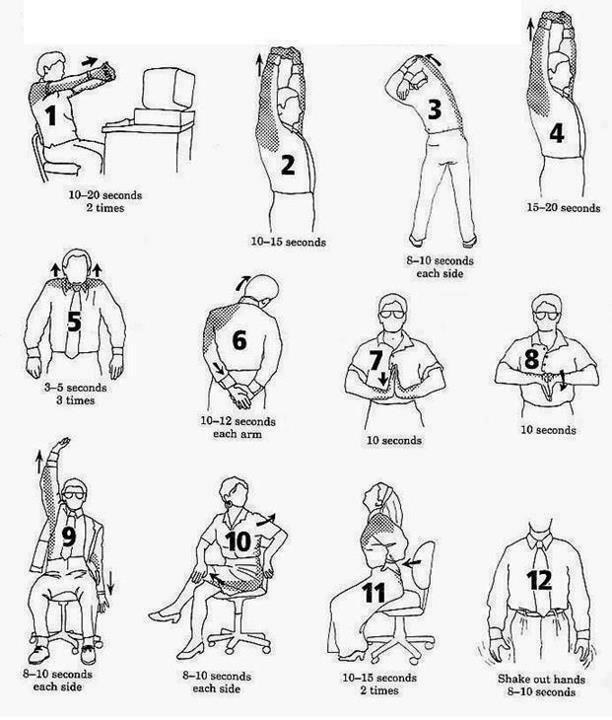 After 20 minutes walk 20 paces if you sit in one posture for 20 minutes. This will help blood circulation for the entire body. As we know eyes are mirrors of our soul so we should take care of them, they are priceless. In this part you will see a picture below. Just follow these steps and you will be awesome. inshallah. I hope this picture helps you a lot. Incorrect posture habits may cause serious problems like cumulative trauma disorder CTD or repetitive stress injuries RSI. So prevent those habits. I'm also sitting with very wrong posture so i have to write myself first. Sometimes we remain in one posture for a long time. Our muscles become stationery and circulation of blood decreases which cause ucomfortablity to perform. Observing a regular exercise program. IF YOU FIND THIS ARTICLE HELP FULL .... JOIN THIS SITE BY PUTTING YOUR EMAIL IN SUBSCRIBE BUTTON..